Email marketers know that the subject line plays a vital role in the open and clickthrough rates of an email. Subject lines are the first micro-yes that a subscriber agrees to in order to continue up the sales funnel. For many, writing a powerful subject line with value-packed words and a sense of urgency will single-handedly increase open rates and lead to higher clickthrough. However, with marketing emails rendering differently across different email clients — such as Gmail or Outlook — content and images often get corrupted from the marketer’s initial concept to the final result. Without proper testing and copy editing, discontinuity can become a fast problem for marketers and, even worse, lead to confusion and mistrust with the customer. In this post, we’ll look at two emails from different travel sites whose subject lines are promising quick deals and the challenges that they face with email marketing. The first email comes from a budget airline — known for cheap fares but charging for “extras” such as carry-ons, drinks and oxygen (just kidding about that last one). The subject line is well-written. It presents an offer value (fares starting at $39) as well as reduces anxiety and friction by stating “you just have to go,” implying that it is a simple, easy process to get these fares. When I opened the email, I immediately skimmed for the $39 deal. It wasn’t long before I read through the email a few times and noticed that the deal wasn’t on the email. It turned out that the message did not render correctly — probably Gmail trying to save me from the length and scope that the email was trying to cover. However, because the subject line promised the deal and I could not find it in the message that I received, it felt like the sender was not upholding their end of the deal. I then clicked to open the email in a Web browser and once again, searched for the $39 deal. It was the 40th call-to-action on the email. Specifically, it was number 40 out of 87 primary calls-to-action. The friction was so overwhelming that it made this email a chore to skim. One of the challenges that travel sites face, especially budget sites, is that they have many deals and destinations to share — especially if the subscriber has not selected a specific “alert” or deals to and from specific places. However, without reinforcing the value and incentives throughout the email, the friction becomes overwhelming. When composing an email, remember that the email is not the landing page; it’s the step before the landing page — where you demonstrate what you can offer, not showcase everything that you have to sell. The next email comes from Kayak.com, a site that works as a search engine for cost-effective fares and hotels. In the image below, I’ve included an email as it appears in Gmail as well as Outlook. The subject line is very similar to the first example, with two unique differences. First, notice the specificity of “Top 25” — this increases the relevance of the email and also decreases the anxiety by clearly showing how long the email is and what the reader can expect. Secondly, although this subject line doesn’t have a phrase like “so low, you have to go,” to lower friction like in the first example, the way that it’s written with “Your KAYAK Alert” and that it indicates “(no change)” reduces anxiety in a way that the first email does not: by insinuating regular updates. Looking into the body copy, this email immediately ties the promise made in the subject line to the content of the email. This not only reduces anxiety and increases orientation, but, if the email provider decides to cut off the email at a certain length (like we saw in the first example), the subject line still fulfills its promise. In the Outlook version below, seeing the red “x” boxes and the warning of downloading content might cause anxiety in readers. However, potentially an even greater source of anxiety would stem from not seeing a recognizable logo, which acts as a credibility indicator. Testing emails and how they are rendered by different email clients should be an essential part of your email marketing strategy. Whether you’re sending all-image or text-only emails, specific clients and providers have their own influence on whether or not the image will appear, what kinds of fonts are supported, and how logos and icons appear. Each element of your email, from the subject line to the tiny gray text in your footer, has a decisive impact on how your customer decides to take action on your email. 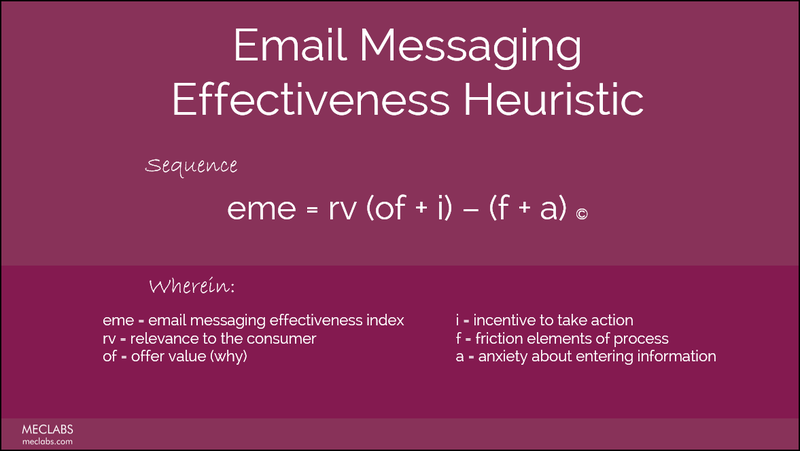 Whether that action is to delete the message before they even open it or to purchase, how you strategically leverage the elements of the email heuristic can impact your customer’s final decision. You can follow Jessica Lorenz, Event Content Manager, MECLABS Institute, on Twitter @JessicaPLorenz.